It’s not news that science has a gender problem. For years, there’s been a persistent gap, with significantly more men going into science and engineering careers than women. One program called “Girls on Ice” connects high school girls with both science and mountaineering — another space that’s historically been dominated by men — by taking them out for a week to explore a glacier with an all-female team of scientists and mountaineers. One of the “Girls on Ice” trips takes place in Alaska, on Gulkana Glacier in the eastern Alaska Range. Mia Tucholke is a mountain guide and one of the leaders of the Gulkana trip. And on the day of the girls’ hike to base camp, she stands at the start of the Gulkana Glacier trail, surveying the group of 16- and 17-year-old girls as they struggle to pull on mountaineering boots and gaiters. As they do, Tucholke reminds them that in a few hours they’ll be taking all the gear off to cross what she jokingly calls a “lovely warm river.” The girls groan, and one of them wonders how they’ll dry their feet without towels. “We’re going to air dry them!” Tucholke said cheerfully to the long faces around her. Some of the girls are already pretty familiar with the outdoors, but others have never hiked up a glacier, spent a night camping in the wilderness or crossed a freezing river with a pack on their back. Now, they’re about to spend a week on Gulkana Glacier with Tucholke. 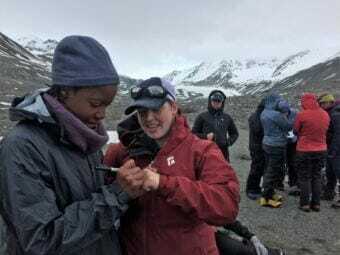 Tucholke and a group of scientists will spend the week teaching the girls wilderness skills, glacier science 101, how to do field research and all the different ways you can make observations about the natural world — whether that’s as a mountaineer, a scientist or an artist. 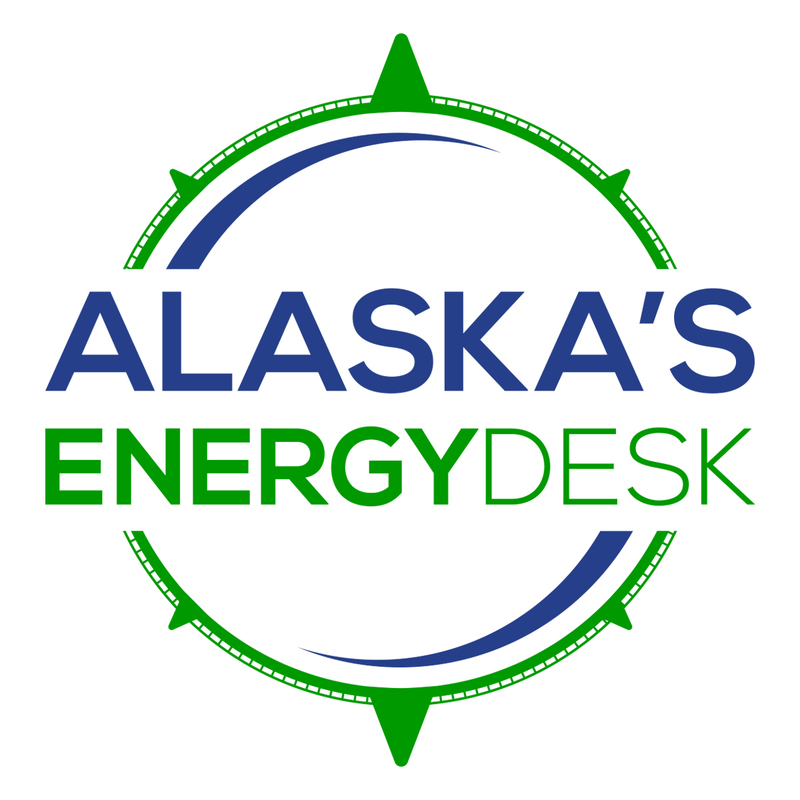 Aurora Roth, one of the instructors, is a glaciologist from Fairbanks. Some of the girls participating in this program already know they want to go into science: everything from zoology to astrophysics to nursing. Lauren Smith is a high school senior from Portland, Oregon. She’s not sure exactly what she wants to do with science, but she does have one idea. “My absolute dream would be to write about science in a way where it would be accessible for everyone,” Smith said. Even though there are more women in science than there used to be, instructor Emilie Sinkler says that the relatively low number of women in science and mountaineering makes it harder for some girls to see themselves getting involved. “There aren’t as many role models to look up to these days just because of the history of those fields being mostly male-dominated,” Sinkler said. Under 30% of the science and engineering workforce is female. And while it’s hard to quantify how many women spend time mountaineering versus men, as of 2016 only 8% of guides in the American Mountain Guides Association (AMGA) were women. AMGA says that number is rising, but they don’t have more recent figures available. So part of the goal of “Girls on Ice” is to just give girls exposure to women who scale mountains and do science and show that it’s an option. “We want to give them extra confidence and experience in the outdoors and in science to see if those are the directions they might want to go, potentially,” Sinkler said. 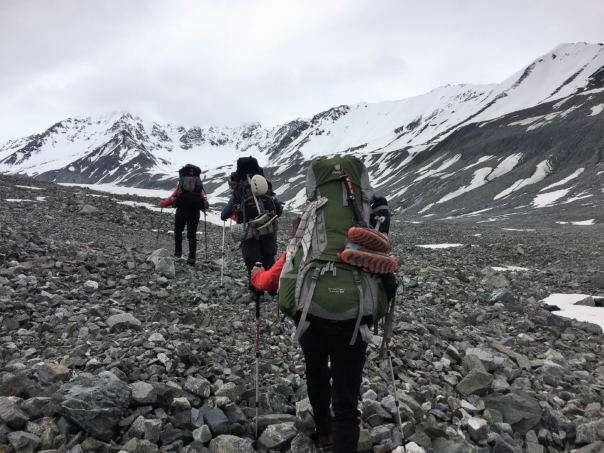 Beyond that, instructors hope that spending a week braving the Alaskan wilderness with an all-female group will inspire the girls to take on whatever challenges they encounter in their lives. Anything. Even, as so many of the girls were worried about, side-step with a heavy pack on your back through a tumbling glacial river so cold it gives you brain freeze.